Seed by Seed, the Legend and Legacy of John “Appleseed” Chapman was written by the vibrant, thoughtful, fun and generous Esmé Raji Codell. Esme holds Johnny Appleseed as one of her heroes, and loves to share his story with children: many children, all kinds of children. You, and someone you know. I have illustrated six picture books and three novels of my own, and I drew spot illustrations and a jacket for Sharon Denslow’s chapter book Georgie Lee, but this was my first try at an all-out picture book written by another author. I learned so much while illustrating Seed by Seed, and I had such a good time learning it. 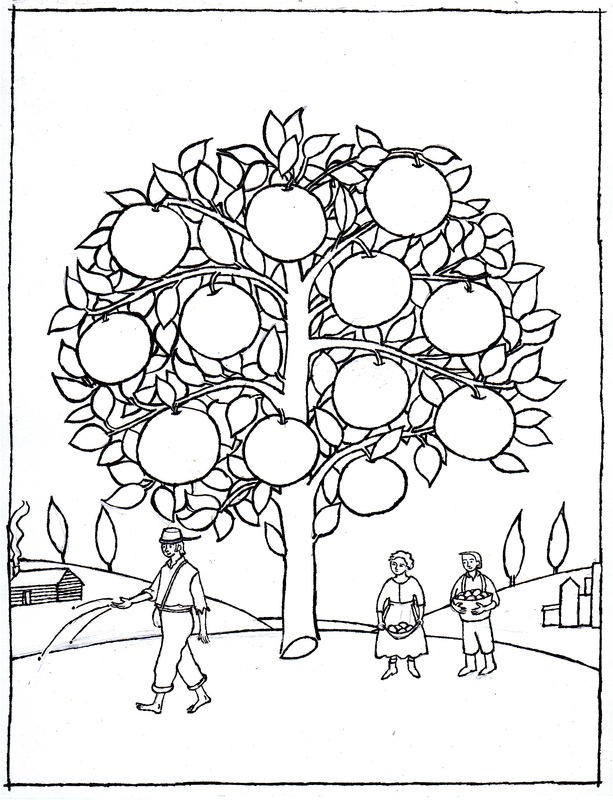 First, of course, I learned about Johnny Appleseed himself. Esme’s beautiful manuscript taught me a lot. But as the illustrator, I had some blanks to fill in. Like, what did Johnny actually look like? My husband Bill and I traveled to the Johnny Appleseed Museum in Urbana, Ohio, to see what we could find out. I asked a young man who is a friend of ours, and who himself reminds me of a Barbara Cooney illustration, to dress up in raggedy clothing and do Johnny Appleseed things while I photographed him. It was the middle of winter, so Ren pretended to plant apple trees and camp out on our dining room floor. My first drawings leaned heavily on these photos, but once I had a sense of him, I drew him from my imagination. 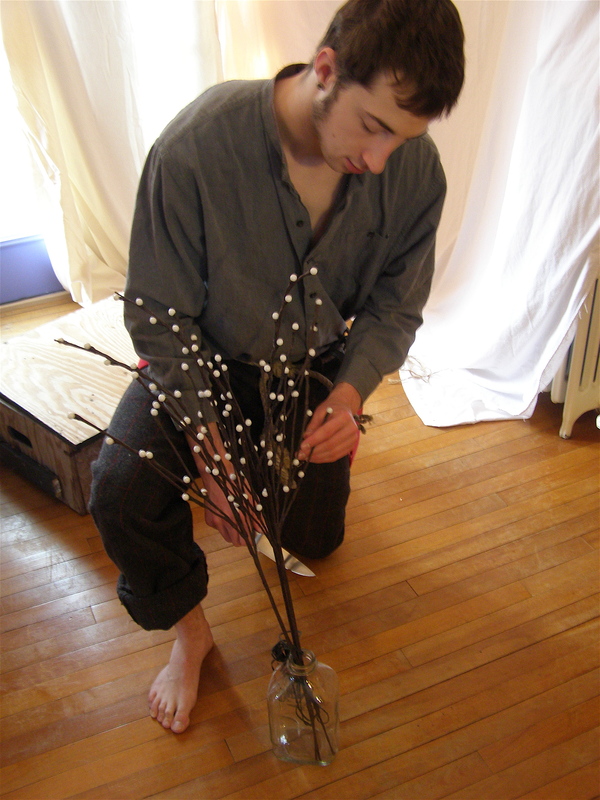 Johnny tends the electric pussywillow. Mr. Price’s book also told me about J.A.’s early life, elements of which appear in Seed by Seed as a visual counterpoint to Esme’s description of the things we expect heroes to do that Johnny did not do. 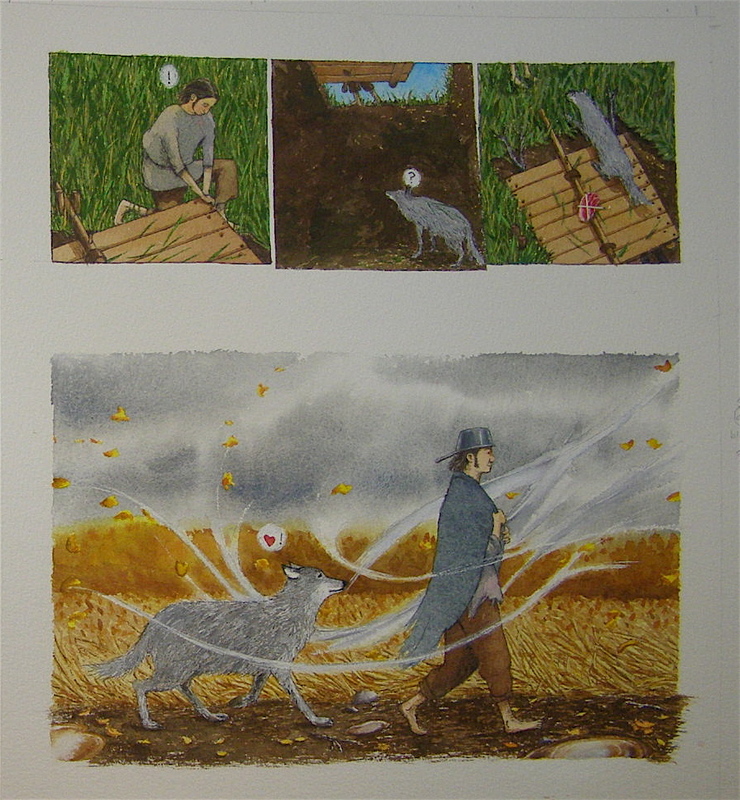 Johnny frees the wolf from the trap, whereupon it follows him around like a dog. And Barbara Greenwood and Heather Collins’s A Pioneer Sampler: the Daily Life of a Pioneer Family in 1840, written for younger readers than Tunis’s, was also extremely helpful. 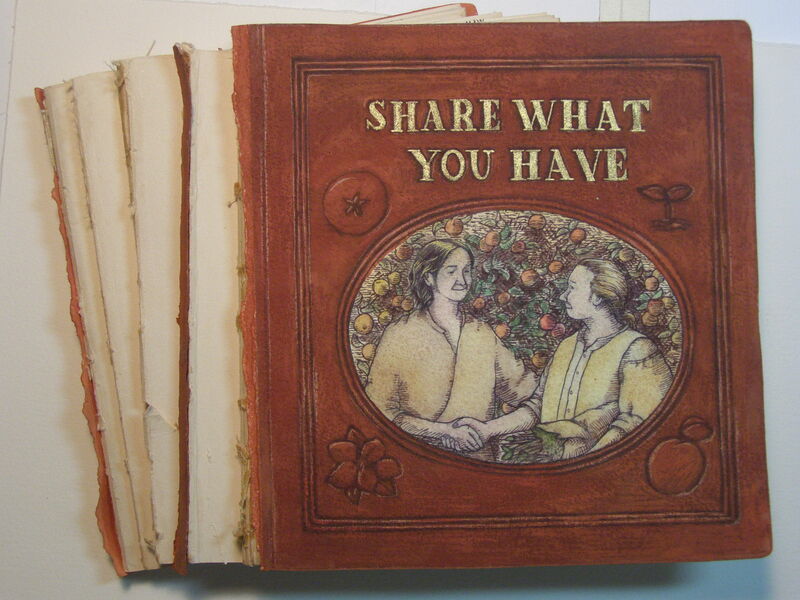 This one includes a lot of hands-on activities to help kids (and me) understand what life was like, way back when. I spent one afternoon at a taxidermy museum, drawing their stuffed wolf. The wolf in the book was drawn from photos because the one in the museum could not change his pose for me, but it was helpful to have drawn the real thing, even when working from photos. the wolf at Guntzviller Spirit of the Woods Museum. I learned about the homes and clothing of Native Americans who lived in Ohio at that time. I looked online for images of mistreated horses, and was saddened that they are not hard to find. Conversely, I was happy to be reminded that many people and organizations are helping kids to discover that they can, in fact, change the world a little bit. 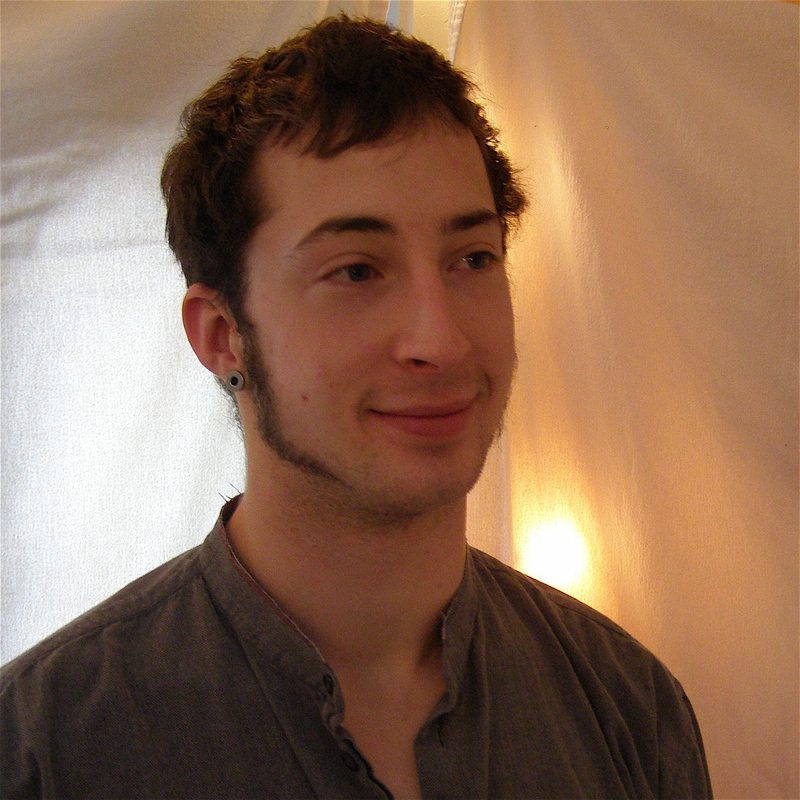 Esme writes about the “five footsteps” Johnny left for us to walk in, ideas that we can emulate in our own lives. I decided to try to embody those ideas in physical objects. I thought it would make it easier for kids to remember them. Also, I like, really really like, making stuff. This meant more research, because I wanted the objects to represent the idea, but also to be of Johnny’s time and place. I wanted them to be things that would have words on them: maps, books, embroidery, painted signs. But what did those things look like back then? Which things were present in ordinary people’s lives? Johnny ripped books into chapters, to share them. So I did, too! 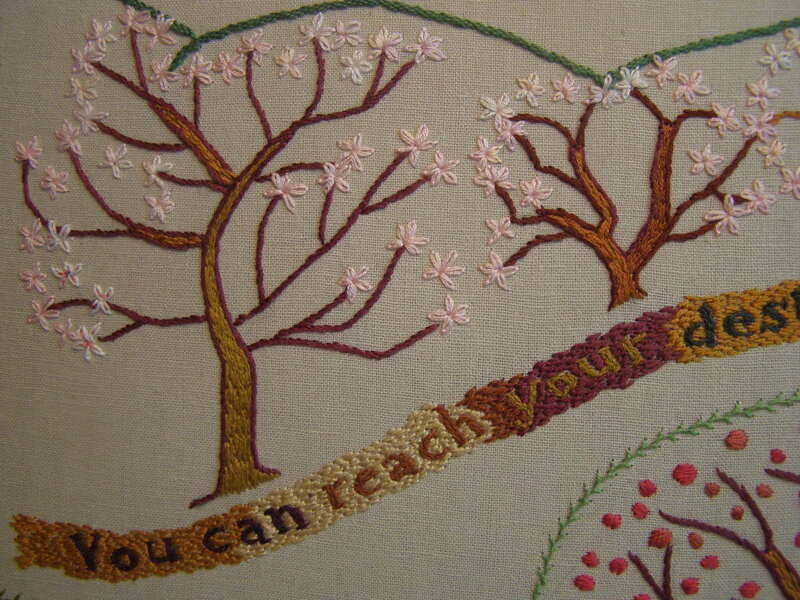 a small section of the embroidery in Seed by Seed. Every time I put something in a picture, I tried to make sure it was something that could have really been in that place and time, whether it was a fabric pattern or a species of snake. But I tried to let all that information be there, not just for its own sake, but to support what Esme wanted to tell us about the wonderful Mr. Chapman. I hope the book will plant a small seed in your heart, and I hope that seed will grow and grow. You can make “seedballs” — little balls of earth and seeds that you toss into abandoned lots and neglected places, so flowers can grow there. Find out how here. You can make a Johnny Appleseed Jump-up, a toy similar to those played with by children who lived in the time of Johnny A. Instructions and print-outable, colorable cut-out-able drawing for one of these right here. 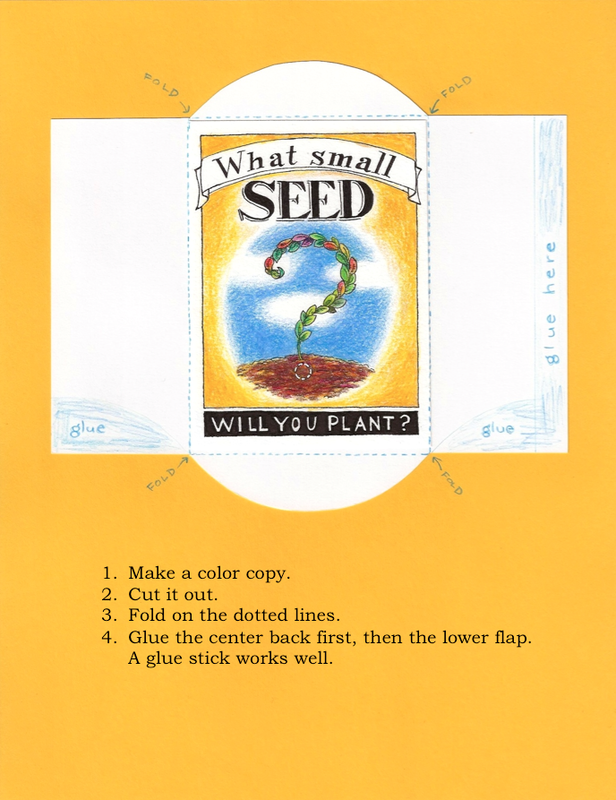 And here is a template to make a small seed packet. What small seed will you plant? I am going to order about a thousand of these books! oh, good! Do you want to see what the inside looks like first? I think this would make a fantastic wedding present, too! I’m going to head right out and get myself a nice latte — thanks! 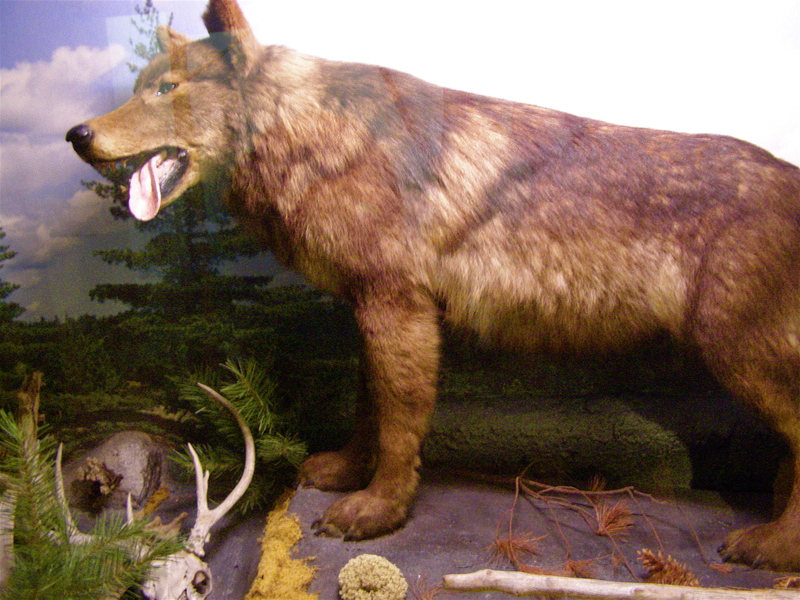 I love the wolf, that is ours in our museum “Spirit of the Woods Museum” we’re just south of Elk Rapids in northwest Michigan. We love historic stories also. I loved sitting in your museum drawing. Thanks!